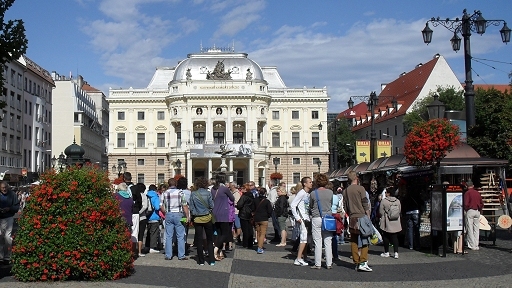 ﻿Piešťany, a charming spa town, played host to UNICA 2014. The mayor himself welcomed more than 200 delegates from around the world. 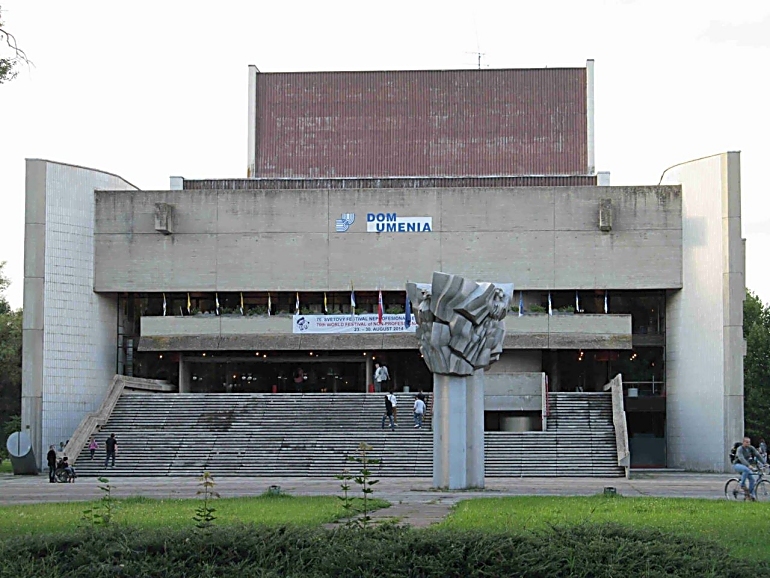 The screenings, opening and closing ceremonies were all held in Dom Umenia (Arts Centre), a 600-seat theatre with fine projection and sound systems. The translation team had a glassed-in box at one side. There was a coffee bar and exhibition spaces, where we were given a chance to meet the artists as well as enjoy paintings and sculptures. Behind the stage area were offices, rehearsal spaces and meeting rooms - some of which were used by the organising team, the UNICA Committee and the jury. 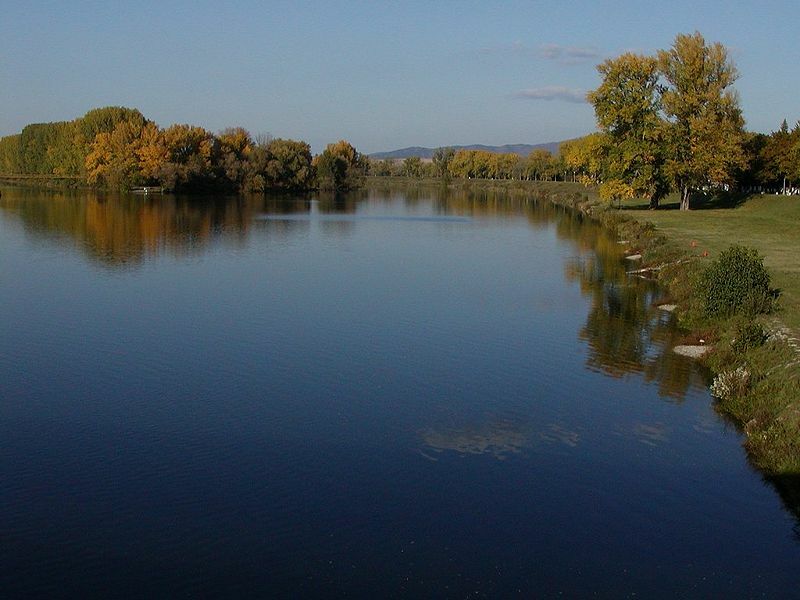 The town's main spas are on an island in the river, where sulphurous mud and water are the healing ingredients. 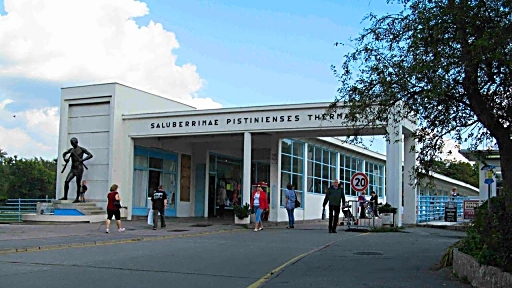 The island is packed with luxury hotels and treatment centres. 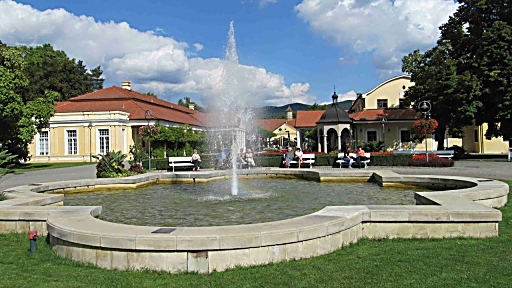 The landward area of town has a wealth of hotels, shops, cafes and parks. Access to the island is across a covered bridge which has attractive stalls selling souvenirs. 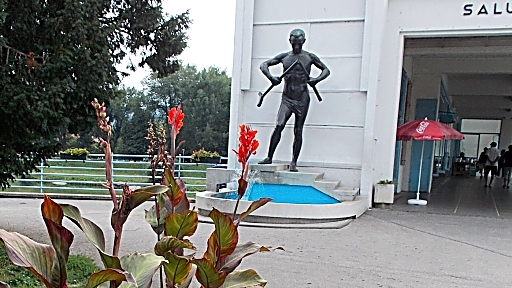 The statue featuring a cured man breaking the crutches he no longer needs has become a symbol of the town. Most delegates passed it daily strolling from hotel to Arts Centre. (l to r): Anton Szomolányi (Slovakia), Vjekoslav Zivkovic (Croatia), Romy Van Krieken (Netherlands), Josep Rota (Spain), Tomáš Hučko (Slovakia), Guido Haesen (Luxembourg), Dave Watterson (United Kingdom, Jury Chairman) and Rolf Leuenberger (UNICA Committee member and jury-wrangler). Over the week they assessed and commented on 103 films. (The four films from Argentina were shown out-of-competition because it had not paid its membership fee. Several countries also presented introductions to their programmes, those films are not judged by the jury.) They awarded altogether 3 Gold Medals, 13 Silver Medals, 24 Bronze Medals, 32 Diplomas of Honour and a number of special prizes. The Jury Prize (a trophy kindly donated by the Mayor of Piestany) went to Christmas Card by Borisenko Karina (Ukraine). Click here to watch many of the films shown. Unusually the full-day excursion was on Sunday - arranged to avoid weekday traffic jams. 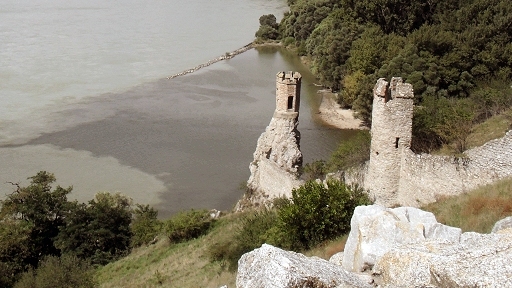 We visited Devín Castle set on a bend of the Danube where the Morava river joins it. The attractive ruins were supplemented by stalls offering a chance to see medieval life. Then into the city, where we had lunch, then a tour of the centre partly by antique style buses and then on foot. The evening meal was in a converted cinema. 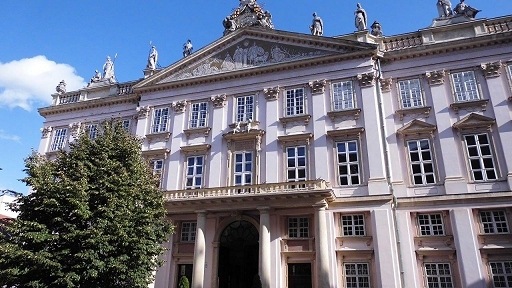 Jury member Anton Szomolányi was excited by this since he had visited it often while skipping school as a child. The opening show featured an organ recital and the musician even played the UNICA Anthem for us. The closing show featured local gypsy music and singers ... thanks for the video from Philippe Sevestre. The Maiden Tower at Devin Castle. The old Slovak National Theatre. The event was organised by Zuzana Skoludova, with the support of Jan Kuska, Wolfgang Freier, Pavel Nunuk and many others - including the technical team who had done the honours at Liptovsky Mikulas when UNICA was there in 2007. The translation team led by Claire Auda included Josianne Myre, Till Monet, Jean-Claude Lejosne with occasional assistance from Monika Haskova and Denisa Brlášová. 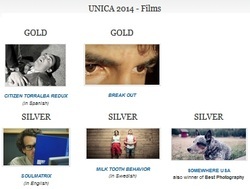 Few delegates realise that the UNICA committee has many meetings during the festival, often while the rest of us are enjoying films. This year's discussions were wide ranging and sometimes heated. In addition to their committee work Thomas Kräuchi (treasurer) was often resolving problems with delegate fees, Jan Essing (general secretary) brought his own computer and printer to prepare award diplomas. Georges Fondeur (president) was required to meet, greet, pose for pictures with VIPs, delegates and the jury as well as giving interviews and making spontaneous presentations. The town's mayor, Remo Cicutto, culture officers and the director of the Arts Centre went out of their way to make our visit enjoyable. They attended formal events in the auditorium and were also often around backstage or in the foyer. The pictures on this page are thanks to Atanas Balakchiev, Oskar Siebert, Rolf Leuenberger, Jan Watterson. 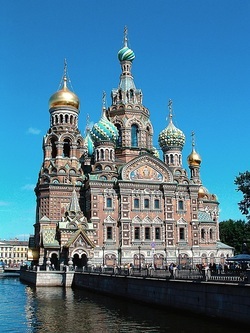 This photo of The Church of the Saviour, St.Petersburg, Russia is by Dionysus is from Wikimedia Commons.